Packed full of free drinks, special offers, discounts on excursions and even restaurant deals, the Benidorm Book not only saves you money but is ideal for finding the very best that Benidorm Has to offer. Full details here. 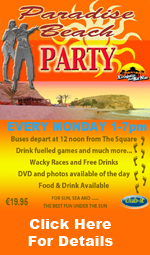 6 Hours, 6 Pubs, Free Drink, Games & Prizes What are you waiting for get out & enjoy yourself. Have you tried space hopper races in the sand, tried to paddle on Childrens inflatables? Benidorm has some great clubs and over the years has even hosted some of the best DJ's in the world such as Judge Jules, David Morales, Carl Cox to name but a few. Although the big clubs are mainly Spanish they do host English nights during the summer season. 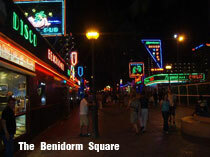 The main clubs for the British are in or around the Square and the best way to find out whats on where and to save yourself loads of money is to get the Club-it Benidorm Discount Book that has free drinks, meal deals and discounts on excursions. The Square is basically a strip of 10 pubs/clubs that is the main centre for British tourists. The square starts to fill up at around 9/10pm and goes on until 7am in the morning. Jokers is one of the largest clubs just off The Square. The club is complete with outside terraces and a garden where in the summer they have the foam party. 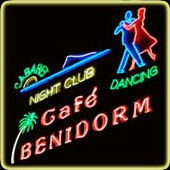 Cafe Benidorm or" Cafe B" for short tends to attract an older crowd and the with music from the 60's to the present day. The Hippodrome club plays non stop dance music all night right through until 7am in the morning. The Benidorm top road has huge clubs stretching up both sides, UK Club DJ’s, foam parties, pool parties, trance, R&B, funky house, dance, Benidorm clubs have it all with the lights, dancers and the most electrifying atmosphere. It does not get going till 2 or 3 am but stays open till 8 with some of the benidorm clubs opening at 7 am until sometime (we still have not made it till the end) in the afternoon. This is for serious party people. Entrance ranges from €20 - €30 (£16- £24.00).